This superbly styled cabin offers a perfect luxurious getaway. Ideal for small groups of friends & family looking for the go-to cabin experience. It also suits couples looking for a nature-oriented “home away from home” or a romantic break. Great for people looking for an out of the ordinary stay. Our High Tech setup of "Retriever’s Retreat" really offers a unique combination; stay "connected" if you need to, zone out if you have to. Comfortable, calm and convenient. We love to go that extra mile so you feel like you are at home. Without a doubt, this place makes for a true “revival” for those in need of one. We are sure you will enjoy this home as much as we do. - Fire pit in the large yard! - We have no cleaning fees compared to other cabins. - We offer free early check in as early as 10 a.m. and late check out as late as 8 p.m if it's available. We will try our hardest to get you in as early as possible for check in and have as late as possible for your check out so you can enjoy the cabin. - We provide guests with a 26 page Berkeley Springs information guide - this is an 'insider's guide' to where to shop, favorite restaurants and what to order, places to avoid, and “not to be missed” events and activities. During your stay at Retriever's Retreat, there are activities to please everyone in your group. For those who want to relax and pamper themselves, enjoy dining, antiquing, shopping, and soaking in the warm mineral waters. There are five full-service spas providing a variety of services such as massages, manicures, pedicures, wraps, acupuncture, reflexology, and reiki. At the Berkeley Springs State Park Spa, you can take a soak in a Roman bath and have a half-hour massage for just $40 (Mon-Thurs), $45 (Fri-Sun). If you prefer to spend your vacation outdoors, Retriever's Retreat is only two miles to the 6,000 acre Cacapon State Park where you can enjoy basketball, tennis, miles of hiking trails, mountain biking, horseback riding, cross-country skiing (winter), rowing/paddle boating, swimming, fishing, and golfing on the course designed by Robert Trent Jones, Sr. Be sure to hike or drive to the scenic overview. - Charles Town Races and Slots. We also recommend that your group take a drive to the Berkeley Springs Panorama Overlook which is rated by National Geographic as one of the five best overlooks in the Eastern United States. It's stunning. Enjoy the Berkeley Springs Farmers' Market every Sunday morning from the end of April to October. Friendly people, welcoming mountains and a sense of placemark Berkeley Springs, West Virginia as a vacation getaway for all seasons and tastes. 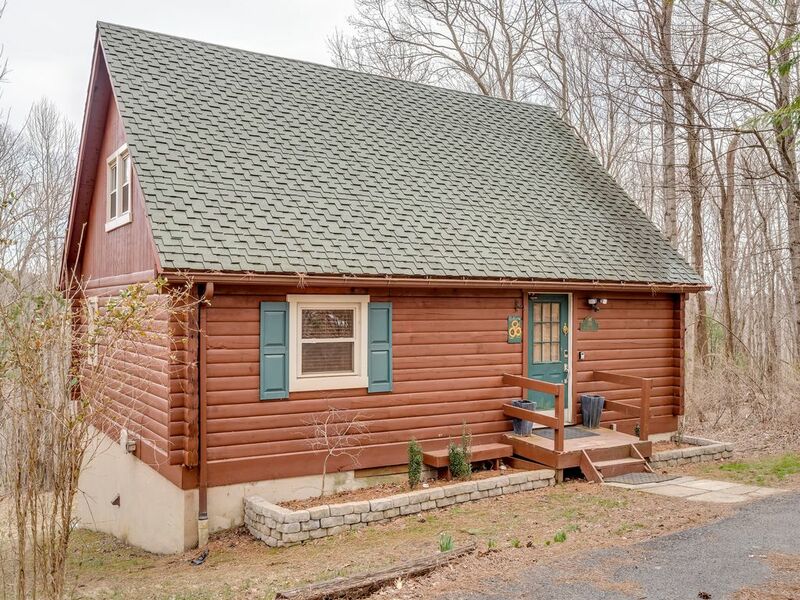 On our first visit to Berkeley Springs, we were drawn to the character and charm that the town offers, and we soon found ourselves in the office of a local realtor ready to make an offer on a cabin near Cacapon State Park. The cabin had “good bones” but had been neglected by the previous owners. We spent the next year renovating “Retriever’s Retreat” (https://www.vrbo.com/130256) and making it into our haven from our hectic schedules and pace of life in DC. Soon thereafter, we found another home in need of some TLC, and we quickly began work on “Jack Russell’s Ridge.” (https://www.vrbo.com/138293). As pet lovers, we are pleased to be able to share our pet-friendly homes with your family, and we hope that your time in Berkeley Springs offers you a chance to enjoy the company of family and good friends. We’ll supply you with: - High-end bed Linen - Bathrobes - Toiletries (Soap, toilet paper, paper towel, shampoo, conditioner, body lotion) - Superfast & Free WiFi - Towels (2 per person) - Fully made comfortable beds - A Microsoft Surface Tablet - Coffee aficionado setup - Keurig and Drip coffee - Several full Propane tanks for BBQ Grill - For added convenience, we have added a Wine refrigerator with 90+ point wines for $25/wine Living room amenities - Fully Furnished & exquisitely designed - Fully equipped kitchen with stainless steel appliances - SMART TV – (BRAND – see above request for more elaborate description) Extra facilities - Bluetooth enabled JBL speaker - Extremely comfortable queen & king size beds - PS4 with Games - ROKU (NETFLIX and Hulu Plus) - Arcade game - Pellet Stove - Washer & Dryer - Grill - Fire pit in the large yard! Free Benefits for our guests: - We have no cleaning fees compared to other cabins. - We offer free early check in as early as 10 a.m. and late check out as late as 8 p.m if it's available. We will try our hardest to get you in as early as possible for check in and have as late as possible for your check out so you can enjoy the cabin. - We provide guests with a 26 page Berkeley Springs information guide - this is an 'insider's guide' to where to shop, favorite restaurants and what to order, places to avoid, and “not to be missed” events and activities. Main bathroom has shampoo, conditioner, hand soap, body lotion and several toilet paper available. Hair dryer is also available. The cabin gets cell reception, but we have a landline phone at the cabin. All bedrooms have AC units including living room. Electric Fireplace, Baseboard heaters in each room and portable Sunheat heater. Fully made beds, pillows and pillow cases, bath and kitchen towels are provided. Also, soap, paper towel and toilet paper are provided. High-speed Wifi. We also have a computer on site with a 24-inch monitor. We provide between 6 to 8 towels. Leather couch and leather chair with ottoman. We have a coffee table. There is a 42 inch HDTV, Roku, Blu-Ray Player, Wii Console and surround sound stereo. There is an electric fireplace as well. We have both Drip and Keurig coffee makers. We also provide coffee grinder. We also have several condiments including salt, pepper, sugar and more. Everything you need to cook is at the cabin. We have setting for 6 people. We have all possible dishes and utensils that you need. Stainless steel appliances including toaster oven, blender, coffee maker (both drip and Keurig) and much more. Three television. Living room and main bedroom are HDTV. All TVs have Roku boxes which stream Netflix and Hulu Plus which has the latest movies and TV shows with over 10,000 to choose from. There is Dish HD Network with over 100 channels including Sirius radio channels on 42-inch wall mounted LCD HD TV. All 3 TV are LCD. We also have Showtime and HBO within Hulu Plus. Upgraded to Blu-Ray player. We do have a DVD player as well. We have several books for kids and adults. Bluetooth music speaker to use with your cellphone. We have Roku available in both the living room and main bedroom. Roku streams both Hulu Plus and Netflix. Netflix streams over 10,000 movies/tv shows including the latest movies and shows. Hulu Plus offers unlimited instant streaming of this season's top shows, classic series, and acclaimed movies. We also have several DVDs. For Wii, we have the Wii Resort game and several other games. PlayStation 4 we have several games as well. Mountain views during the winter time. There is an 18 hole championship golf course within 2 miles of the cabin. 50 inch HDTV LCD Television, Dish Network with Sirius Radio, 5.1 Yamaha surround sound, CD/DVD players, Bluetooth Wireless stereo, Washer and Dryer, Leather sofa and recliner, Plush King, Queen and Full beds, Log style table, Stainless steel appliances, Sport equipment, Extensive Board games, Roku with Netflix and Hulu Plus streaming, Extensive DVD movie collection, electric fireplace, BBQ grill, fire pit, linens and towels provided, set of His and Hers Plush robes, 2 miles to Cacapon State Park and more. Retriever's Retreat is located in Berkeley Springs. Berkeley Springs is an historic spa and art-filled town nestled in the West Virginia mountains only 90 minutes from the Washington/Baltimore metro area. It boasts warm mineral springs, world class dining, dozens of unique shops, five full-service spas and more than 100 lodging choices from elegant B&B's and historic inns to cabins and resorts. Golf, hiking and swimming share the schedule with year 'round festivals, live music and theater. - Holiday weekends have a 3-night minimum - A great low weekly discount rate of $850 per week (normally $1050 per week) - We have no cleaning fee like other cabins. - We only allow dogs and up to two dogs. - Just $25 pet fee per pet for your entire stay with us.